Sweet. How long did it take you? I have the supplies to do it myself, seems pretty simple in your pics. Maybe an half hour a side at most. Once I got my hands on a fibre cutting wheel about 1.5" in diameter it was a breeze. There is part of the casting that has to be removed underneath. $15 for 6" LED strips and some 100% silicone and you are in. 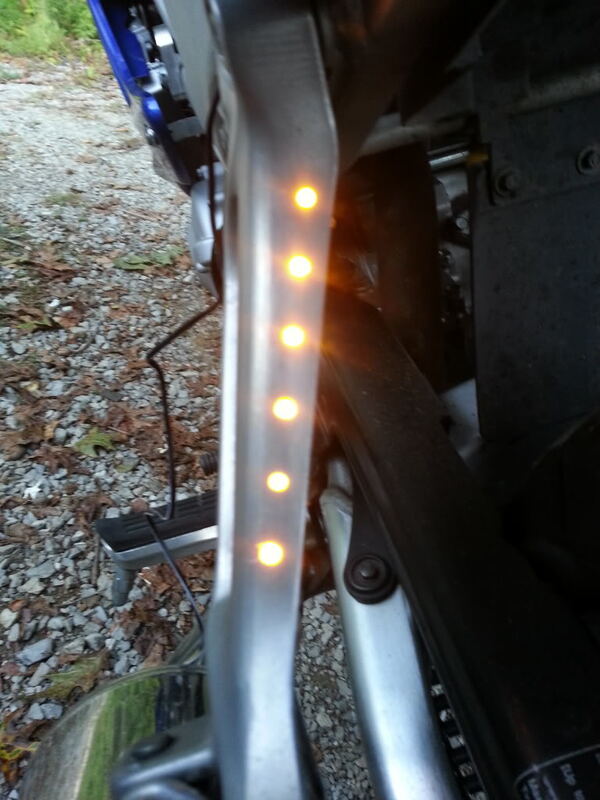 Just finished installing 12" amber LED strips inder the windsheild along the fairing on each side. Soldered them in as turn signals. Cool mod but what was the cutting wheel for? Looks like you drilled holes & put leds. Pic is kinda close up to tell how it looks. Work great on my givi topcase. Post some more pics. And tell about the grinding fiasco. Last edited by jerryh; 09-24-2013 at 05:56 PM. Best front turn signal indicators?